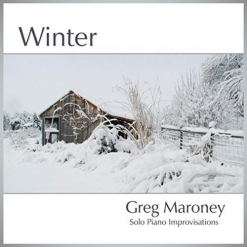 My first introduction to Greg Maroney and his music was when he sent me his third album, Sentinel, to review in early 2002. I loved the album and visited Greg’s website to learn more about him. There was a photo of Greg playing the piano barefoot, and I knew this was someone I had a lot in common with! (That photo is no longer on Greg’s site, but it’s in the first interview we did back in 2005!) 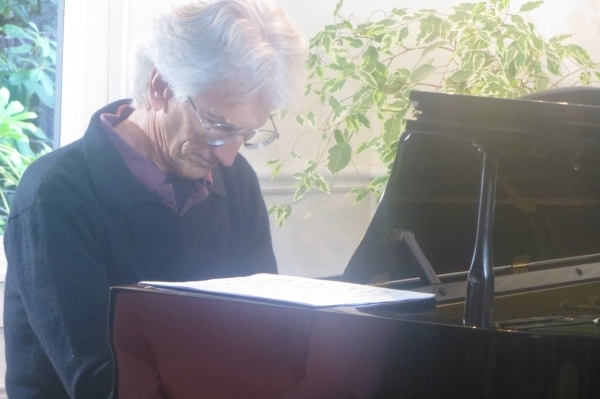 Since then, I’ve been proofing Greg’s sheet music (most of which he has transcribed himself), and he has played three house concerts here - one with Wayne Gratz, and two with Michael Dulin. We’ve become very good friends over the years and Greg is one of my favorite people as well as a top-favorite pianist/composer. Since he retired as a trauma nurse a few years ago, Greg has produced a huge amount of music with no slow-downs in sight. He is also doing more experimenting with composing and recording techniques with more surprises coming in the near-future. We talked about a lot of different things in this interview, so enjoy! KP: Hey Greg! How are things in Pennsylvania today? GM: Hi Kathy! Great to talk with you about all things music and life in general. My wife, Linda, and I are getting ready for the winter weather here; it is getting colder and snow is just around the corner. All of the gardens have been put to bed and food is stored in the cold cellar. The heater is clean and turned on and we are good to go! KP: I saw the video you posted on Facebook yesterday of you and your dog playing in the snow, so it looks like it has arrived! You had another amazingly productive year last year with the release of five albums and five singles. I think it was about this time last year that you released Winter, the first of the four albums in the Seasons series. 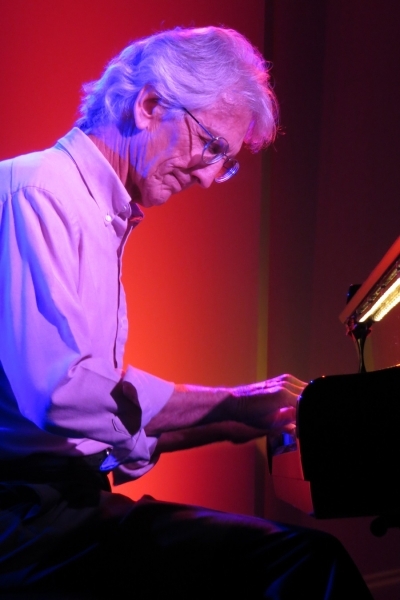 What inspired you to do the series of improvised piano solos? GM: This is a good question. I did release a lot of music in 2018. I think my best and simplest answer of how I did this is I just “got out of the way” and let the music pour out from my fingers. Most of my albums up to this point consisted of formally composed songs, each one taking about a month to get just right. It would take about a year to produce a whole album with this style of writing music. Now that I have the ability to record in my own studio on a totally wonderful Steinway D concert grand piano, my writing/playing has taken on a whole new dimension. Incorporating all of the composing skills I have learned up to this point, I can just let my imagination run free and see where it takes me. I am able to place my mind into neutral, and let the spirit of the song come out. Inspiration happens best later in the evening when it is quiet and I am undisturbed by the noise of the day. KP: That’s interesting because a lot of the composers I’ve interviewed and talked to have said they usually compose in the morning before the rest of their day gets started. It sounds like you work best when the “must-do’s” of the day are done and you are free to relax. It certainly seems to be working! GM: I mostly work on my concert repertoire in the morning, or polish a song that I am getting ready to record. I also work on one or two classical pieces. 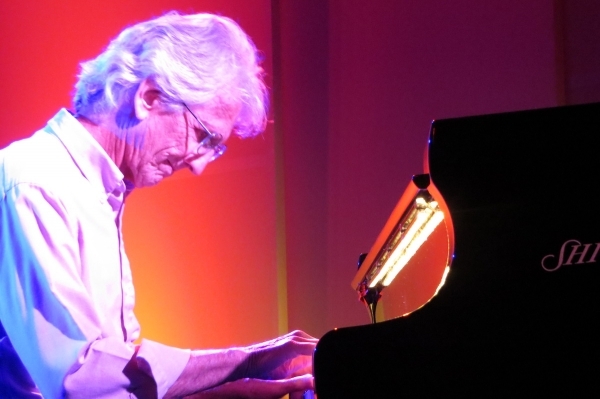 I find that the best time for me to really get into improvisational music is in the evening, when it's quiet. But....if I am spending a few days recording, I will improvise any time of the day or night. KP: Do you have a favorite of the Four Seasons albums? GM: Hmmm, not really. But….I try to place what I think are the best songs as the first tracks on the albums so people will get a good feeling for the whole album. I don’t place the others in descending order of favorites; rather I try to make sure the flow is there, and there are not two songs that sound similar right together. I like them all equally, and think the Four Seasons Project stands pretty well as either a series or as individual CD’s. KP: I totally agree! 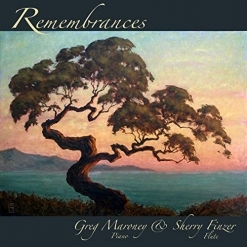 The fifth album you released in 2018 is a collaboration with flutist Sherry Finzer, Remembrances, that just came out in December. How did that project take shape? GM: It’s interesting how it came about. Sherry was here to play a house concert about 2 years ago, and at the end of the concert we did an improvised piece, unrehearsed and spontaneous. My wife Linda recorded it on her cell phone, and as we watched it later we were like…. “Hey, that was pretty good, we should do more of that.” I transcribed the piano part and we recorded and released it as the single “The Beauty Lies Within.” Later, we decided to try and do a complete album and see what happens. That Remembrances CD was a blast to make. I have never done a collaboration such as this before, and we are very glad that we did. Basically, I went into my studio and started improvising on a theme while hearing what I thought Sherry would play on her flute. So I was really playing 2 instruments while composing - the piano and the flute. I tried to make sure that the piano was not overwhelmingly melodic, but stood as a good accompaniment to her flute. I then sent the recorded files to Sherry and her recording engineer. They played the songs in her studio while recording her flute, and then through the miracle of engineering, combined the two tracks into one song. Thus, the album was born. It is doing well on Spotify, which is a surprise, as well as making us happy to see its success. KP: The whole album works so well that I really thought you had recorded it together with both parts being played at the same time! You also released a new album earlier this month called Secrets of the Sea, which I love! (Actually, I love ‘em all!) What was your inspiration for that album? the Whisperings All-star Concert in Costa Mesa, CA January 2017. 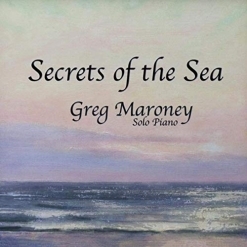 GM: Secrets of the Sea was an experimental album in the way it was played, recorded and mastered. The inspiration for the music was to write/compose something that had a deeper, more mysterious sound, as well as a slightly muted performance. It has a free quality to it, lots of iridescent sounds, with characteristics of Debussy’s music. The muted sound of the piano was really deeply inspiring to me. Normally the piano is brighter, louder and more percussive. Removing some of these characteristics brought about new directions for the music to go, and a deeper emotional response by me to the sounds I was hearing. KP: Was that album improvised, too (like the Seasons albums), or more composed? GM: The album was completely improvised, each song one take only. Believe me, that makes editing difficult if not impossible! But that also means that each song was really “in the moment,” and what you hear is what you get. KP: That’s really amazing! You mentioned that you used some different engineering techniques. Did you also mute the strings at all? GM: We did not mute the piano per se during the recording, but I had the soft pedal, (the one on the far left) depressed. This moves the hammers over to the right just a little bit, so they only strike 2 strings instead of the normal 3. Also, the hammers are a bit softer in that area, and the sound is quieter, more reverent, and more sonorous. For me, the tone inspires a completely different way of playing. We also mastered the sound a little differently than I normally do with the more composed music. We added quite a different style of reverb and the EQ was different. Fortunately my recording engineer is a genius with that stuff and I do not need to worry about it, except to tell him what I want to hear, and he makes it happen. KP: It seems like most of the piano albums from Europe that I’m getting for review are using a muting technique of one sort or another. Sometimes it’s putting felt of varying thicknesses between the hammers and strings. This often allows for the sounds of the inner workings of the piano to become part of the music. Do you have any idea of what started this trend? GM: I have heard some of these albums. Also, a few artists here in the states are utilizing this technique to much success. There is something about a softer, less percussive sound that resonates with people, myself included. But, sometimes the mechanical noise of the piano can become so loud that it starts to distract from the overall performance. KP: I agree. 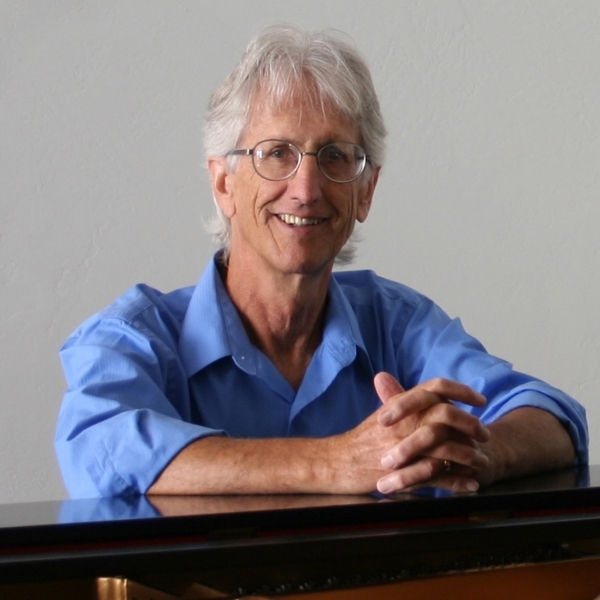 Another technique that is starting to be used (Peter Kater was the first artist I spoke with who is doing this) is to have the piano tuned down to A432 Hz rather than A440. He says it’s so much more relaxing to play in that tuning. Have you looked into that at all? GM: I have not really explored this yet. I did talk with my piano tuner/repair guy, and he was not too enthusiastic about it. I will have to leave that process up to others at this time. I know it relaxes the strings somewhat, making the tone a bit mellower and not quite so percussive. It may be something I look into in the future. KP: I think 2018 was the first year you released singles as well as full albums. Do you plan to include the singles in your albums, or are they separate entities? GM: I think that mostly I will keep the singles as singles, with a few exceptions. The first song I recorded with flutist Sherry Finzer, "The Beauty Lies Within," was originally released as a single, but has now been included in 3 or 4 other compilation CD’s as well as Remembrances that we just released. But I think the singles stand on their own quite well, and I will probably just leave them as they are. KP: Was your single of “Moonlight Sonata” the first time you used this “softer sound” technique? GM: I think so. 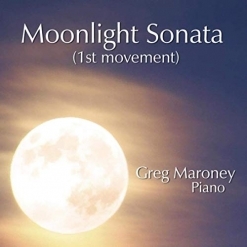 As you had mentioned earlier in an email to me, you thought the first movement of the “Moonlight Sonata” was one of the original “New Age” songs! So I thought it was a perfect song to try this type of sound with. KP: That’s interesting! What will your next music project be? GM: Well, now that you ask, I have several projects in motion. I plan on recording several more classical pieces employing the “soft sound” technique and releasing them as an EP. I also plan on recording a few “cover songs” and see where they go. There really is no limit on ideas I can come up with - we will just have to see what happens in the future! 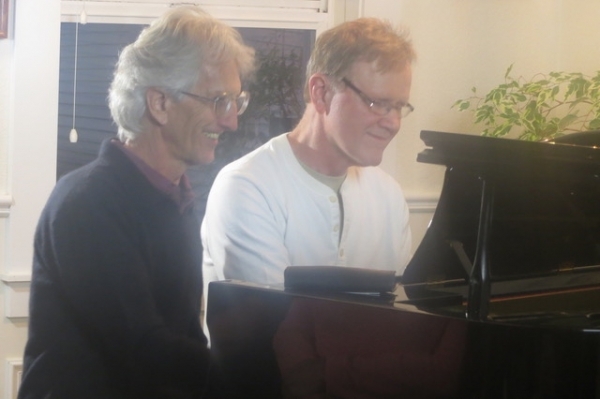 KP: We’ve been working on your sheet music for a lot of years now and you have said that it’s a lot harder for you to transcribe the improvisations. Is that because you practice the more composed music a lot before you record it so that it stays familiar and “in your fingers”? 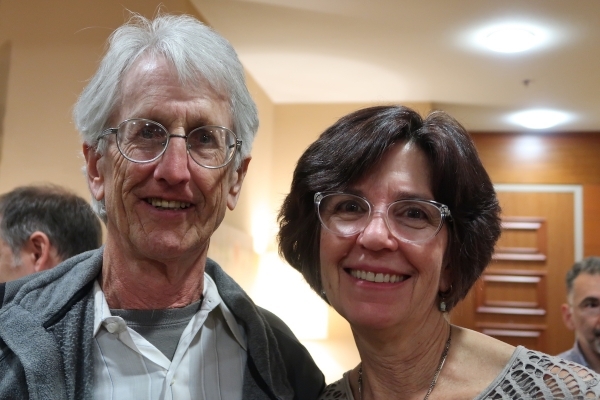 Greg and Linda Maroney in Kirkland, WA March 2018. GM: Good question. To my mind, the improvised songs are quite a bit different from the formal “composed” songs. I work on the composed songs for a while. It takes time for them to take shape, form into songs and then get into my fingers so I can record them. By the time all that has happened, they are fairly ingrained into my daily playing. Notating them is just a matter of putting down the notes I already know. Improvisations, on the other hand, are fleeting moments in time with no preparation - just get in the mood and go. Sometimes the songs can become quite complex, and certain passages are difficult for me to discern exactly what I played. That is when it is good to have a good professional transcriptionist such as Donovan Johnson do the work, then all I have to do is tweak it a bit to get it to how I originally played it. It saves me a lot of time, and I find that the transcription I get back is very accurate. 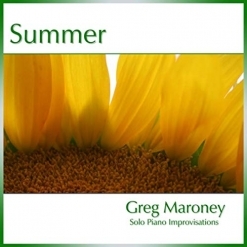 KP: Do you plan to do sheet music for Seasons, Secrets of the Sea and/or Remembrances? GM: Well, I am not sure. At this point I am getting the most popular songs from these albums transcribed. Requests and the songs I especially like get priority. I don’t think I will do any complete albums, but I will transcribe the songs that people would like to play. KP: How is your house concert series looking for 2019? GM: We had an excellent season in 2018, and I had a great time meeting and performing with some wonderful pianists throughout the year. I made a Spotify playlist of everyone who has performed here if anyone would like to know who has played in the Harmony Grove concert series. 2019 is already shaping up to be another great season. I am booked up until next December! KP: And there is the Whisperings Annual Awards Concert and Discovery Concert in early February in the Atlanta area. Are you going to be there? GM: I plan on being there, but am not playing in the concerts. 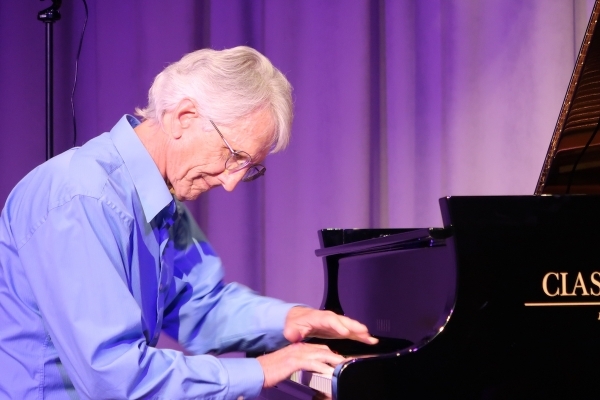 I did play last year, and I know David Nevue likes to share the performance experience with people who have not done it before. 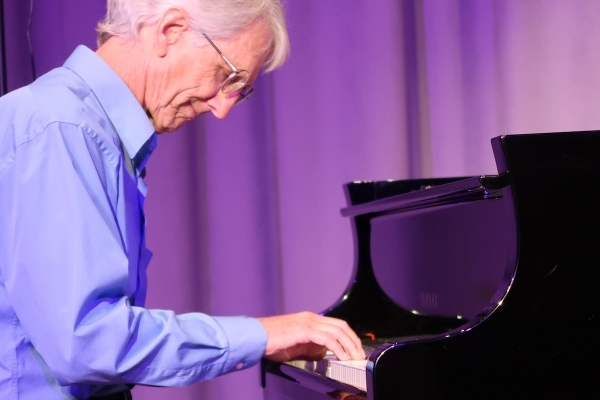 I am really looking forward to being with all the great pianists and friends again. It really is a wonderful community of people who are like-minded musicians. There is a strength in camaraderie. Being a pianist/musician is a unique and weird profession, so it is good to share the common bond of other musicians. 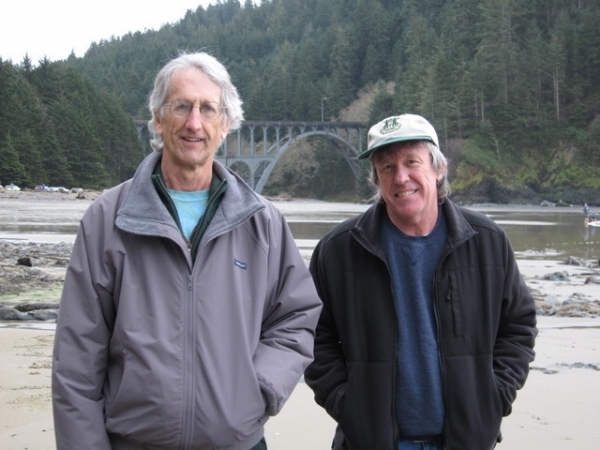 Greg with Wayne Gratz in Florence, OR 2011. 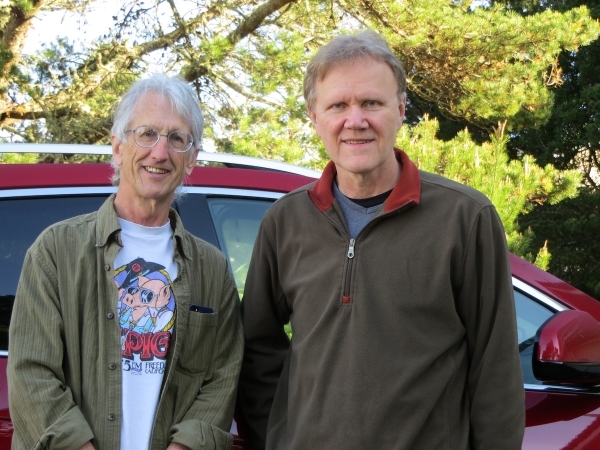 Greg with Michael Dulin in Florence, OR 2014. KP: I’m sorry I’ll have to miss it this year. I loved being part of the Whisperings weekends the past four years and getting to spend time in person with so many artists I’ve reviewed and interviewed - as well as seeing those who have become great friends. It truly is a wonderful group! Hopefully I’ll be able to go next year again! A lot of your fans probably have no idea that you and Linda have a small farm and grow most of your own food. Didn’t you also remodel the farmhouse so that you generate your own power for light and electricity? GM: We do have a small farm out in the country, and love every minute of it. We live on 7 acres in south central Pennsylvania. We have an old farmhouse that we have totally fixed up. It is quiet and peaceful. But no, we are still “on the grid” so to speak, but we do have geothermal heating, where we use the heat in the ground to warm the house. It is good way to get your heat, and no fossil fuel is used to keep warm. And, we just finished a beautiful sunroom, so we should be getting lots of solar gain into the house to help keep us warm. We work 2 different vegetable gardens during the spring and summer months. We have a strawberry/raspberry patch as well as regular vegetable garden. We do grow a lot of our own food, and preserve or freeze it for the winter months. I love doing this! It keeps my body moving outside, my fingers and feet get dirty, and we eat the most delicious tomatoes and other vegetables imaginable. Plus, I get to drive a very cool Kubota tractor with my straw hat on. KP: What fun! How far away is your closest neighbor? GM: Not that far. We can see their house from ours, so we are not really isolated. It is actually pretty good. We live on a dead end street and we have tons of privacy, but the neighbors are close-by if they are needed or if we just want to chat. All the folks in the area are super nice, and will help you at the drop of a hat. KP: Linda is also amazing with her carpentry skills and seems to be able to do just about anything! I love her sense of humor, too. She told me last year that you knew she was “the one” when you saw her handling a chain saw!!! That’s so romantic! Greg and Michael Dulin in Florence, OR 2015. GM: Yes, that was quite a moment when I realized she was the right person for me. I had hit a pretty big low spot in my life about 30 years ago, and had most everything stripped from me. At that time I realized that the only thing that was really mine that no one could ever take away was my love of music and love of the natural beauty around me. These things are a big part of who I am and cannot be separated from my being. I also realized that no one else was going to do anything for me to help me get ahead, I had to do it myself. The old “pull yourself up by the bootstraps” philosophy. So I started to develop building skills and work skills. Then I met Linda and she fit perfectly into my reawakening. She had a chain saw in her hands and was working on clearing some overgrown brush, plus she was really beautiful. I thought, that’s the girl for me! We have been together going on 30 years. We built our first house together, hammering every nail, and extensively remodeled our current old farmhouse, as well as building a barn, greenhouse, and various outbuildings. I built the barn with nothing but hand tools, no power tools! KP: Great story! Linda is also doing more graphic art. Is she designing most of your album and songbook covers now? GM: Yes, Linda has done the graphic work for all of my albums and song books. I think I have 25 albums and 6 or 7 singles plus a ton of song books? Something like that - I have lost count, but it’s been a lot of graphics work. Linda is very talented and creative. 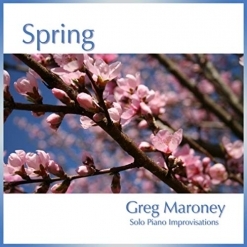 She has also done the cover graphics for several other pianists. KP: I recently reviewed a couple of William Ogmundson’s singles, and he said Linda did the cover layouts for those, too. She’s really good at it! GM: Yes, she recently did the graphics for both a single and a complete album for William. He was recently here recording in the studio and Linda was doing his graphics while he was recording downstairs. We are a full service shop! KP: And you are both such great people to work with! I know we’ve covered a lot of this in earlier interviews, but let’s do a quick re-cap. When did you release your first album? Another image from the 2017 Whisperings All-star Concert. 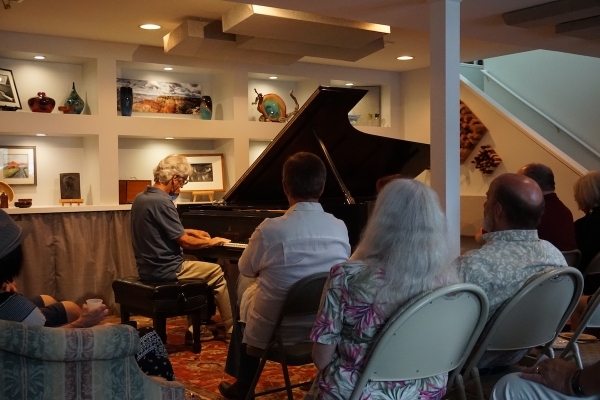 Greg performing a house concert in his home studio. GM: Oh my, that has been a while ago. The story is, I had not really given it any thought, but one day Linda said, “You know, you should record a CD.” I was like, no way, can’t be done. Fortunately, she was smarter than me and insisted I do it. So I started to learn how to record and released the first CD in 1997. Recording conditions were quite different than they are now. I recorded to DAT tape. If you do not know what that is, be glad. KP: Haha! I remember you saying that you also play the lute. Do you still play that? GM: During my footloose and free days in my early 20’s, I played an instrument called a Saz, which is a Middle Eastern stringed instrument. I made a living playing for a troupe of belly dancers. It was much easier to haul around than a piano! I also played the guitar and dulcimer. KP: What kind of “day jobs” did you have before your recent retirement? GM: I have always played the piano, continuing to learn it throughout my life. But, that did not pay the mortgage, so for my day job I worked in emergency medicine for 40 years. First as a paramedic in Santa Cruz, California and then as a trauma nurse here in Pennsylvania. I support myself as a full time musician now, because that is much easier to do with the introduction of streaming services such as Pandora and Spotify. Before the internet (yes, there was a before), if you were not on a label, there was no money to be made as a new age pianist. I loved working in emergency medicine and I think I helped a lot of people during their time of acute anxiety and injury, but I am glad to be done with that and doing only music now. KP: It takes a special kind of person to be able to deal well with trauma and not let it get to them. Where did you grow up? GM: I grew up in the San Francisco Bay Area during the 60’s, and was pretty heavily involved in the counter culture of the time. During the 70’s I lived in a small one room cabin in the Santa Cruz Mountains with no electricity, no running water, and no heater. We had to walk a mile from the road to the cabin. Really, no kidding. It was remote! Now I can’t believe I really did that, but I lived back in those woods for years. When I finally walked out, I worked and lived in the beach town of Santa Cruz. I was a surfer and beach bum/paramedic. KP: I didn’t know you were a surfer! How long have you lived in Pennsylvania? GM: We moved here in 1996. We lived in a small 600 square foot house in California, and the piano took up most of the living room! We wanted to find some land and an old house to fix up, but could not afford to do that on the west coast. After extensively looking around, we did find our dream home in Pennsylvania that we actually could afford. We have modernized the farmhouse, and have 7 acres of land to tend. KP: What has been your most exciting musical experience so far? The Whisperings Discovery Concert in Bellevue, WA March 2018. GM: There have been a few. Playing a concert with David Lanz and Wayne Gratz were highlights, but that has been 10 years ago. Performing at the Whisperings All-star concerts is always exciting. But I think the most exciting thing, and this is not a specific event but a glacially slow effort over time, is the continued success and growth of my music. Who would have thought all this was possible 20 years ago? Streaming and the internet, in all of their forms, have allowed many independent artists such as myself to make a living playing music. KP: It was so much fun when you and Wayne Gratz did a house concert here! I can’t believe it was almost eight years ago! I had “known” both of you for a lot of years - spoke with Wayne on the phone as far back as 1993! - but that was the first time I’d actually met you both! Oops! I digress! If you could have any three wishes, what would they be? GM: 1. The continued success of my music. 2. That inspiration will continue to bless me. 3. That this country would come to its senses and live in peace with each other. We can have differing views, but respect, honesty and integrity need to prevail. KP: Amen! Is there anything else you’d like to “talk” about? GM: I think we covered a LOT of ground! I don’t really have anything more to add, except to thank you for your support of the musical community. You have done a tremendous amount of work, including interviews, reviews, and editing sheet music to name a few. You are a busy person, and you have the respect of the whole community. KP: Thanks so much, Greg! And thanks for taking time to do this update! 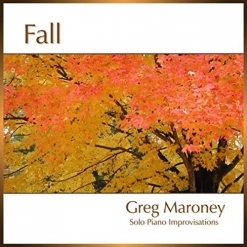 For more information about Greg Maroney and his music, be sure to visit his website and his Artist Page here on MainlyPiano.com. All of our previous interviews are linked from Greg’s Artist Page, too!